Let’s talk carbon policy and equity outcomes for low income Californians and communities of color. This November, the fourth quarterly carbon market auction of 2017 sold out of carbon allowances, with allowances going for the highest prices in the system’s history (though at $15/ton, still modest compared to the social cost of carbon). Buoyed by the extension of cap-and-trade until 2030, the November auction raised over $860 million for the Greenhouse Gas Reduction Fund, which finances projects to reduce greenhouse gases (GHGs) and deliver environmental, health and economic benefits to communities. CLICK TO TWEET: Polluters paid in #California & revenues are up! Here are some ideas from @Greenlining’s @eminwang how to use those $$$ to transform disadvantaged communities. So what’s the big deal, and what does this mean for our most impacted communities? For us, it says three things: 1) carbon revenue is stable for now, 2) we must invest in programs that have transformative impact, and 3) we must invest in critical capacity-building resources so that all communities can compete for state funding. For the first time in a long time, carbon revenue has stabilized. This most recent auction falls on the heels of the third quarter auction that similarly boasted all allowance permits selling out at then-highest prices. That’s in contrast to the system prior to the extension of cap-and-trade, when uncertainty in the market and doubts about its continuance beyond 2020 led to anemic auction results and revenue. For this coming year, this means that we can expect to see well over $1 billion for projects to reduce GHGs, boost public transit, provide incentives for energy saving and more. So, what to do with over $1 billion in auction revenue? For starters, we can continue investing in programs that we know have real impacts on disadvantaged communities. In 2016, we supported a bill that created Transformative Climate Communities (TCC), a program to fund comprehensive and coordinated GHG reduction strategies at the neighborhood level. Its administering agency, the Strategic Growth Council, enacted a public process that resulted in Guidelines that go the farthest that we’ve seen in centering community leadership, economic opportunity and anti-displacement. The results of those Guidelines, preliminary though they might be, are clear — TCC is kickstarting a new kind of community development that starts with the needs and visions of those impacted by multiple sources of pollution and socioeconomic burden. In Fresno, TCC inaugurated a community planning process that started top-down and ended bottom-up. Over the course of 90 days, over 529 residents participated in 11 community meetings to determine how to spend $70 million in TCC funding. 126 stakeholders wielded direct voting power, and southwest Fresno residents proposed and selected (nearly unanimously) a package of 25 projects, ranging from a community college campus to mixed-income housing to new parks to solar. In LA, three different proposals are being submitted by coalitions of community-based organizations working together with their local municipalities to deliver equity and meaningful community engagement. And in neighborhoods across the state, the TCC process has spurred communities to collaboratively vision how they want to act on climate locally. We saw this process firsthand, as we supported the City of Stockton and community stakeholders to come together and develop the internal capacity necessary to apply for a Planning Grant. We’re tremendously excited about TCC, and think it merits substantial resources. This past year, though, TCC received only $10 million, far below what is needed. As the governor prepares his January budget proposal, TCC should get the funding it deserves in order to have an impact across California. By planting leafy street trees or better connecting low-income housing to public transit, these programs help to renew some of our most impacted neighborhoods, but, some were severely underfunded in last year’s budget. 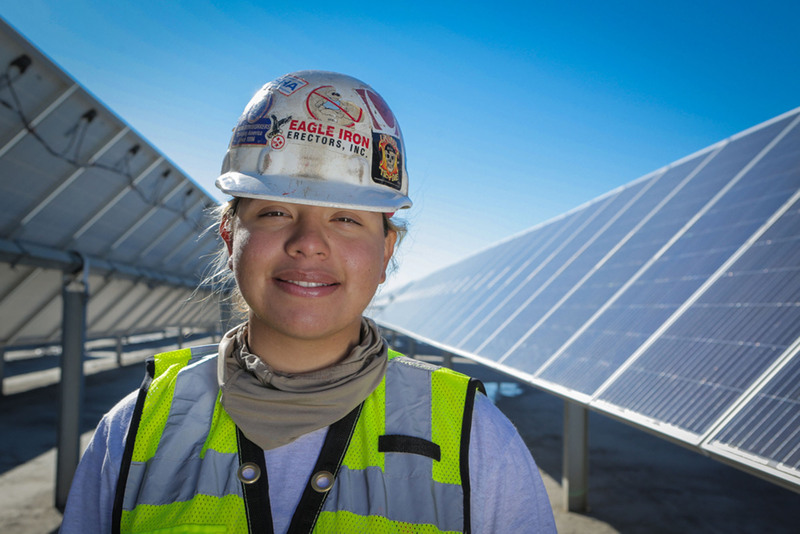 Vital programs such as providing solar to low-income families can’t be shortchanged once again to give kickbacks to industry. Finally, as we invest in mitigation, we must also look forward to adaptation. As my colleague Jordyn wrote recently, California allocated dollars to climate adaptation (preparing for the impacts of climate change) for the first time this year, and those efforts must prioritize our most vulnerable communities. California has made significant commitments to address systemic inequities through targeted investments to low income communities, through alphabet soup policies such as: AB 1550, AB 523, AB 617, SB 1 etc. These policies are often implemented separately from one another, without the coordination necessary to stretch dollars and maximize multiple social, environmental, health and economic benefits. Moreover, the most impacted and hardest to reach communities usually have the least resources and capacity to compete for funding. To see the success we want, we must prioritize deep outreach, capacity building and technical assistance for community-based organizations, local governments and other stakeholders. If the state is serious in its commitment to our most vulnerable areas, every community in California, small and large, must have fair access to tools to lead local transformations. More to come on this soon in 2018 (but if you’re interested in learning more, we’d love to hear from you; shoot me an email at emiw@greenlining.org). Emi Wang is Greenlining’s Environmental Equity Manager. Follow her on Twitter.